Join the discussion on our forums! 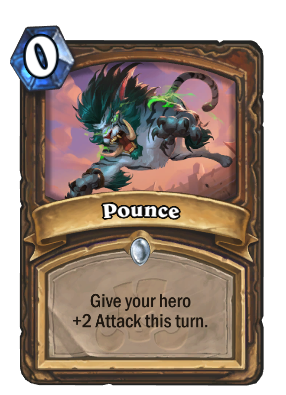 Come discuss Pounce over in our dedicated Pounce discussion topic. Give your hero +2 Attack this turn. Comes with an overwhelming urge to jump into the nearest open box. Like a Backstab for tempo decks. The first rounds that killed an Sorcerer's Apprentice and Dire Wolf Alpha today and lethal at once. Pretty good synergy with Violet Teacher and Gadgetzan Auctioneer from the old Token Druid. Also new synergy with Gonk, the Raptor and Spirit of the Raptor. Might actually be better if it costed 1 so it could fit into Odd Druid. This is pretty decent with: auctioneer AND new druid legendary, as you can punch face multiple things. You still have plenty of armor with branching paths. That or they're still trying to make decks that could use savagery. Bonkers for tokens that use auctioneer. Suuuper flexible, 2 damage, 3 damage with basic hero power or 5 damage with DK. If you pair up the attack buffs just right and time the twig death rattle just right, you could do some ridiculous amounts of damage with the Hero power (DK Hero power is better) and Gonk, the Raptor. Savagery and the new Druid minion that deals damage to a minion based on hero power damage doesn't hurt either. Gonk has a lower rating than Duskfallen Aviana, and I think that's just nuts. Cool card, even better WoW ability but before release it's hard to say if that is support enough to see Feral druid in HS. I think this card can see play in any kind of tempo druid, not just Feral. 0 mana, deal 2 damage is very strong. I mean, Backstab has been a staple for tempo Rogue since release.